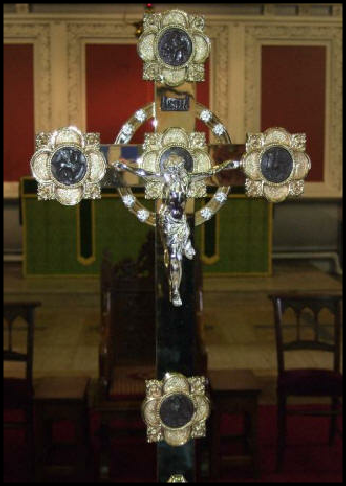 On the 18th of July, 2010 Holy Trinity suffered a burglary during which two very old and rather special crosses were stolen and it is believed sold for scrap. Although the thieves were arrested the crosses were never recovered. 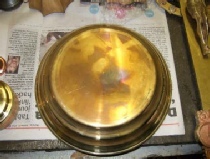 Replacements have been created by a firm of Silversmiths called 'Anvec' in Birmingham's Jewellery Quarter but attempting to make copies of artefacts when all that you have to work with are rather poor photographs is by no means easy. During the same incident the Chain of the Chairman of Amblecote Urban District Council was also taken. This unique item was too difficult for the thieves to ‘fence’ and was disposed of in a storm drain. Excellent detective work by West Midlands Police retrieved the chain which was refurbished and is now on permanent loan to the Broadfield House Glass Museum. Naturally the cross could not be made in one piece but had to be assembled from a number of custom made parts. On the far left is the heavy brass base. 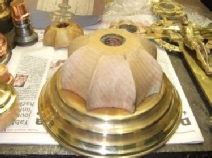 Several wooden patterns were made which were then sent away for casting. 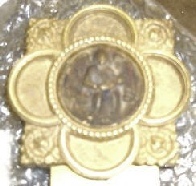 These included the pattern for the Corpus (body of Christ). This artefact came with matching candlesticks and so was less problematic to design but equally complicated to construct. 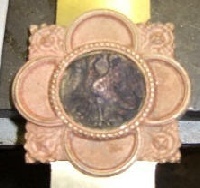 The base is a copy of the candlestick (right) the cross is just awaiting the fitting of the corpus - again cast from a wooden pattern. Both crosses are now complete and back with us but sadly they can now only be displayed during services. At other times simple wooden crosses and candlesticks take their place. 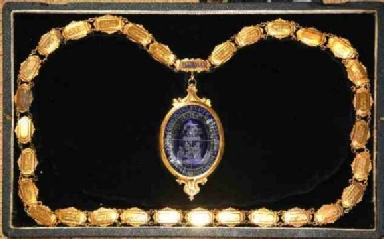 When Amblecote Urban District Council was dissolved in 1966 the outgoing Chairman presented his chain of office to Holy Trinity. The badge had been given to the Chairman in 1960 by Councillor Eric Mees, in memory of his father who had been Chairman from 1928 - 1930. The badge is made from an oval-shaped piece of flint glass cased with blue. The glass plaque is surrounded by a guilt rim. 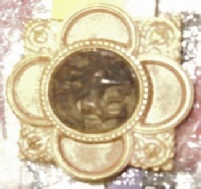 Engraved on the face of the badge are the council's name, motto and three figures depicting local industries. Glass-making in the upper half, engineering lower left and brick-making lower right. The motto "commune bonum" means for "the good of the community" This item is now housed in the Broadfield House Glass Museum.